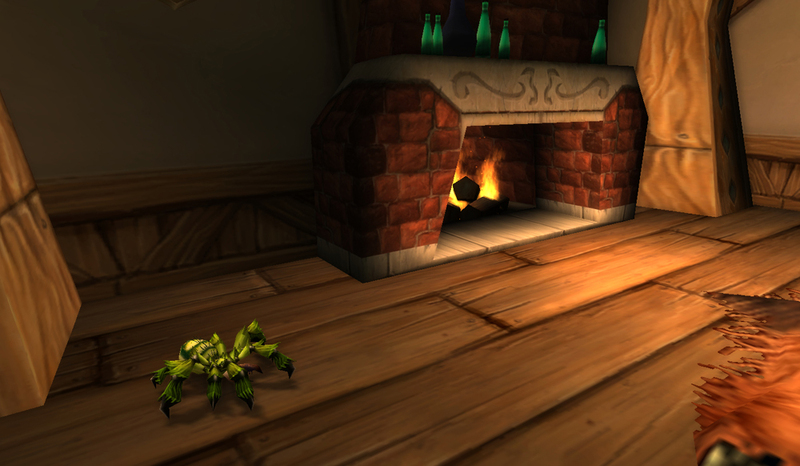 This incorporeal little guy has been breaking hearts since battle pets came to be. 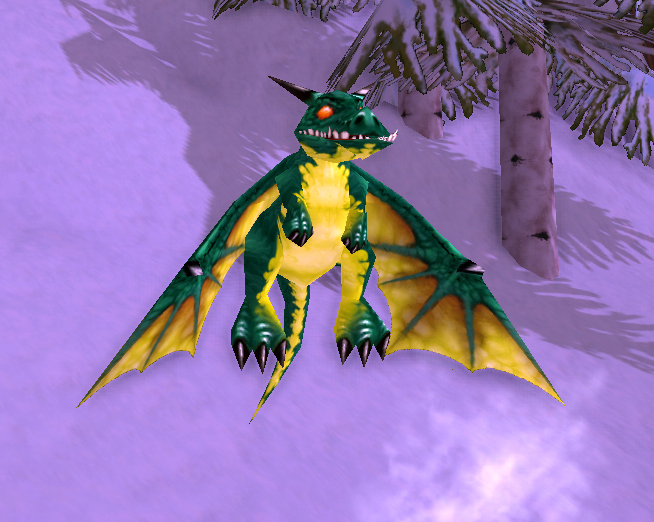 Nether Faerie Dragons are Dragonkin battle pets which like to hang out around Dire Maul in Feralas. They can be tamed in the open air area in the world, and are not present in the Dire Maul instance. They share a moveset with the very colorful Sprite Darters, also found in Feralas, but the Sprite Darters are drops. The two share a very similar skin as well, but Nether Faerie Dragons are transparent, which can make them just a bit difficult to screenshot, thank you very much. Much of a Nether Faerie Dragon’s utility is wrapped up in Life Exchange, which is a fun, quirky ability to use. It equalizes the health between your Faerie Dragon and its target. Initially it completely steamrolled the Beasts of Fable. If your Nether Faerie Dragon starts off at 1384 health and Dos-Ryga starts off with 1942, if your Dragon acts first, it would hit Dos for 279 (the difference of the two numbers, 558, halved, to bring both pets to equal health). But in the earlier iteration of the Beasts of Fable, where Dos-Ryga’s health pool was over 3K, with no damage cap on Life Exchange, it was truly devastating. Now, it’s not quite so key, because of a series of nerfs. That’s alright though, because initially, my strategy for the Beasts was pretty much just frontload a couple dragons, and now it takes a bit more strategy, which pretty much always means more fun. And still, to use Life Exchange properly involves a good bit of timing and luck, because otherwise you could heal your opponent, or get killed before you can pull it off. Beyond that, the Nether Faerie Dragon has a handful of Flying abilities (Slicing Wind and Cyclone) and a handful of Magic abilities (Arcane Blast and Moonfire), which, along with the Dragonkin family defense against Magic, makes it a really good choice to counter Flying battle pets. Sharing a slot with Life Exchange is Evanescence, a move ability similar to a rabbit’s Dodge. It can be more useful than Life Exchange, depending on your opponent, but it’s less unique. Also, I’m kind of afraid if I make this poor thing fade away more than it already has, it may just up & disappear altogether. 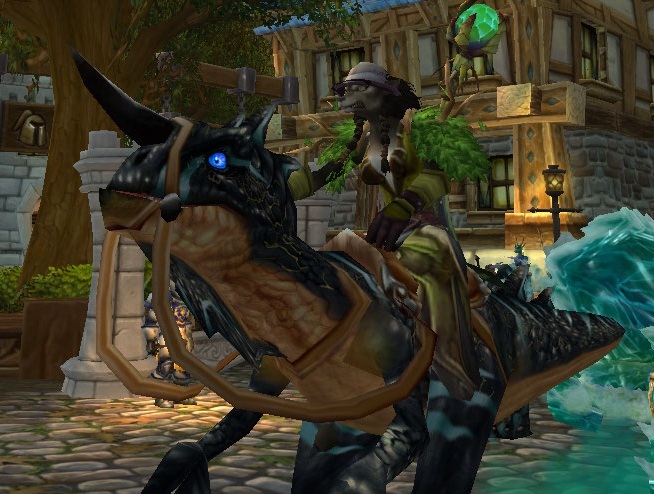 This entry was posted in pet profile and tagged auctionable, dragonkin, drop, tamed on May 23, 2014 by Liopleurodon. 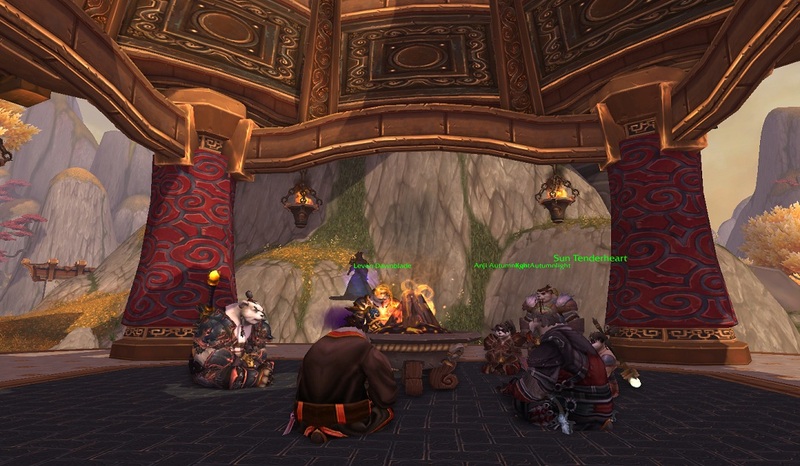 The Saint Patrick’s Day holiday, not celebrated in WoW, has always been one of my favorites. Mostly for obvious reasons. I figured it would be fun to profile one of my favorite pets as well, even though I’m kind of breaking one of my own rules by doing so. 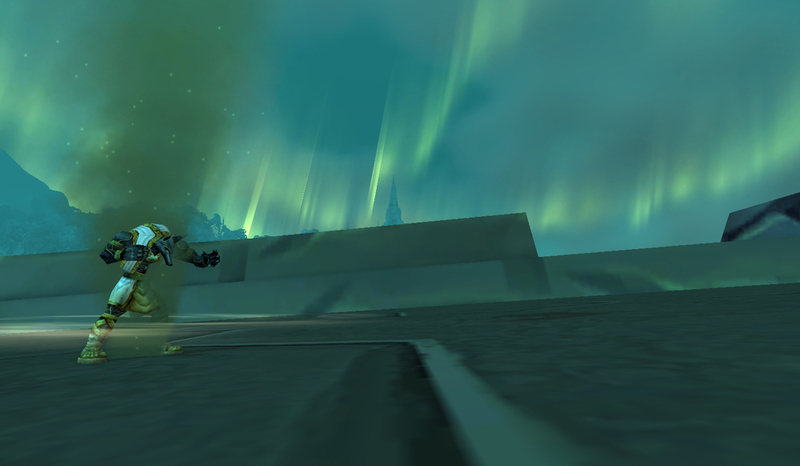 The Emerald Whelpling is a pricey pet, with a rough average around 7000g. If you’re particularly enterprising, you can farm one up yourself. Their spawn point has moved from the Swamp of Sorrows to Feralas, from the corrupted whelplings near the portal to the Emerald Dream, but the drop rate continues to be vanishingly small. This particular profile is mostly for seasonal flavor and sentimentality, but the Emerald Whelpling’s battling prowess can’t be denied either. Though it doesn’t do too much in PVP, in PVE it’s a workhorse with 2 strong heals (Emerald Dream and Tranquility) to choose between, a couple of magic moves, one of which is the synergistic weather effect Moonfire and the other the straightforward Emerald Bite. She also has a Dragonkin nuke with Breath. Her moveset is rounded out with the utility shield Emerald Presence. In a lot of situations, a far less expensive but still somewhat rare Emerald Proto-Whelp can fill a similar role. Especially in PVE the two are fairly similar. The big difference is that the Emerald Whelpling’s moveset can be swapped, so she can turn from a defensive tank with Emerald Presence into a damage-dealing phenom with Moonfire and Emerald Bite. 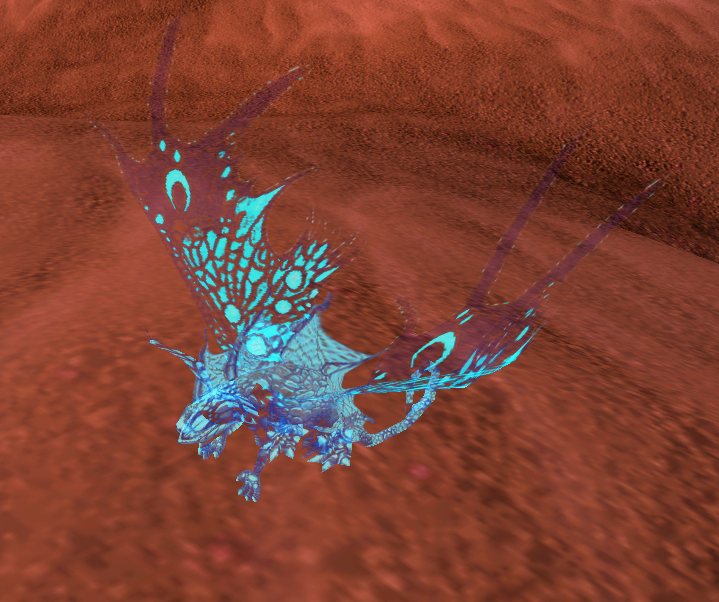 There are many other Dragonkin battle pets available to fill the damaging role too, like the Nether Faerie Dragon which is tamed in Feralas, it’s just somewhat rare for a pet to be able to fill both roles all on its own. Erin go Bragh, something something alcohol! WOO! 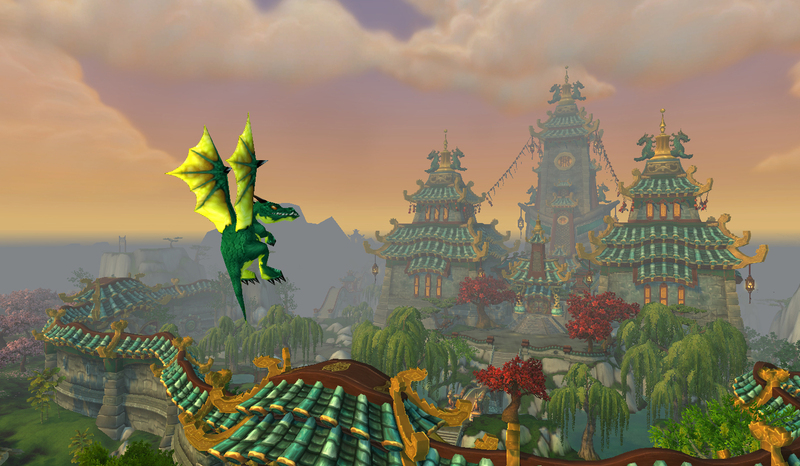 This entry was posted in pet profile and tagged auctionable, dragonkin, drop on March 18, 2014 by Liopleurodon. We’re getting to a weird point in time for many WoW bloggers, and the WoW community as a whole. While most people were very excited at the Warlords of Draenor reveal at Blizzcon, there’s been a dearth of official news since. The gaps have been filled almost entirely via tweetlists (oh and by the way, breeding epic pets are out for WoD, says developer Cory Stockton in this random tweet). 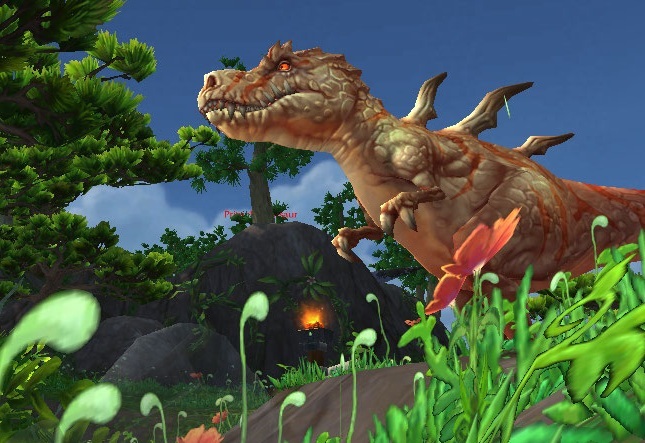 As a result, lots of bloggers have taken to fanciful prognostication, mostly about the nature of this or that about the expansion, including a fun Warlords of Draenor release date pool hosted by Alternative Chat. The other common current blogger pastime ties into this, namely a good amount of schmoozing devs, largely on twitter, and a fairly constant stream of questions asking them what else is coming next. Personally, I still have pages and pages of material to blog about and several videos slated. Beyond that I’ll likely do a few a la minute PVP posts, add to my ongoing leveling saga (you guys WHY did I think this was a good idea? 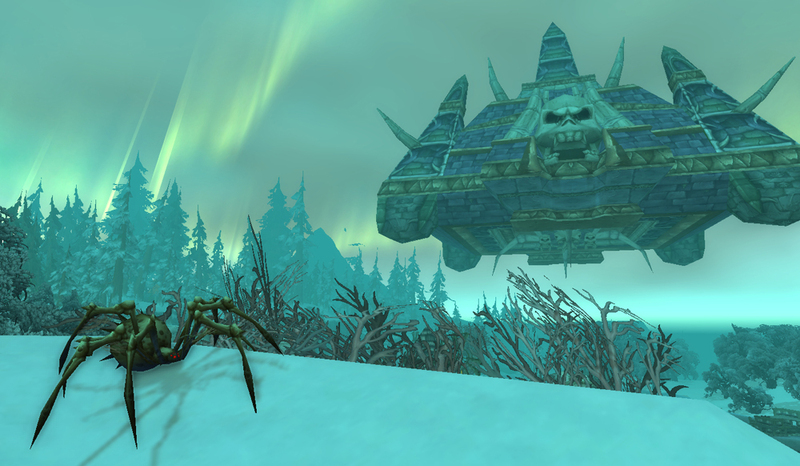 ), and I still have a staggeringly large number of battle pets left to write about. My blog is nearing its 1 year anniversary (!) and if I had written about a pet every single day up to this point I’d still have more than half of them to profile. With so much material left, I figured I might as well combine both my ongoing pet profile series and kissing some developer or CM behind for a scrap of information or two. I’m not proud. 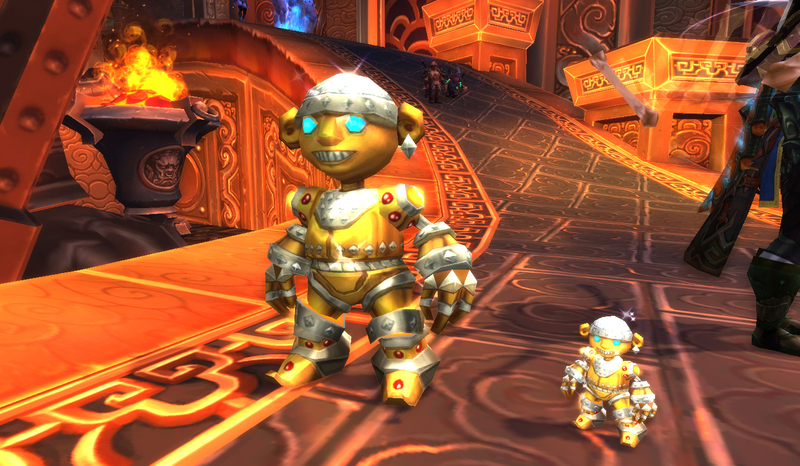 Lil Bling is the son of Blingtron 4000, the friendly, flashy robot who dispenses trashy romance novels, healing potions, and other miscellaneous junk in your faction’s Shrine, or outside the inn at Halfhill. Unless you’re on a PVP server, and then the Blingtron outside the inn is pretty much just a trap for sniping lowbies from the roof of the inn with your frost mage. Look, I already said I’m not proud. Once he’s crafted, the Blingtron 4000 can be dropped every 4 hours by an engineer. If you’re not an engineer, you’re at the mercy of someone who is. At this point in the expansion, the crafting cost isn’t terribly steep (I did have to use my farm to gather the Spirits of Harmony I needed quickly) so it’s a good option for an alt. 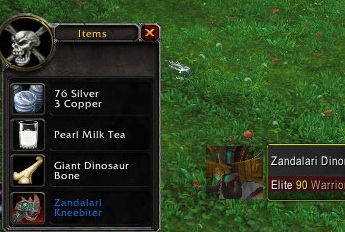 For patch 5.4, Blingtron had a few new things added to his loot table of trash, including a Blingtron Brawler’s Guild fight and the new pet Lil Bling. Lil Bling’s moveset is quite unique and worth looking at. As touched on briefly in the Macabre Marionette post, he is the first Mechanical with the Shattered Defenses debuff with Inflation. Inflation is equally suited to pair with both abilities in the third slot, Launch Rocket and Make It Rain. Make It Rain will win out on fights with a damage cap, like the Celestials, or if you have an extra proc like Call Lightning, but Launch Rocket paired with this buff will all but completely wreck nearly any normal pet. The other choice in the first slot, SMACKTHAT.EXE, works well with on-hit synergy, but doesn’t provide it. The benefit to that skill over Inflation is you’re not locked in for multiple rounds. Rounding it all out in the middle slot is either the damage dampening Extra Plating, or the mixed bag Blingtron Gift Package, which has a 50/50 shot to either hit really hard or heal. The former choice obviously offers far more control vs the RNG-heavy latter, but I generally find the latter more fun. You can just see the person on the other side of the keyboard wondering what the heck was THAT?! I expect we’ll be seeing a lot of Lil Bling in strategies that arise during Warlords. As I mentioned, he is the first mechanical battle pet with the Shattered Defenses debuff, so it stands to reason (or maybe to beg the question) that we may be seeing some big, beefy Beasts we need a tiny robot to beat down in the not so distant future. I would strongly recommend getting one soon, both because of that and because once WoD hits it’s very likely non-engineers won’t be seeing much of this glittery little guy anymore. In addition to the low drop chance from Blingtron’s daily gift, this pet is also tradable, so you may want to just try the auction house. He’s dropped as Uncommon from the box, so if you’re low on Mechanical stones you may want to keep your eyes peeled for the upgraded version. 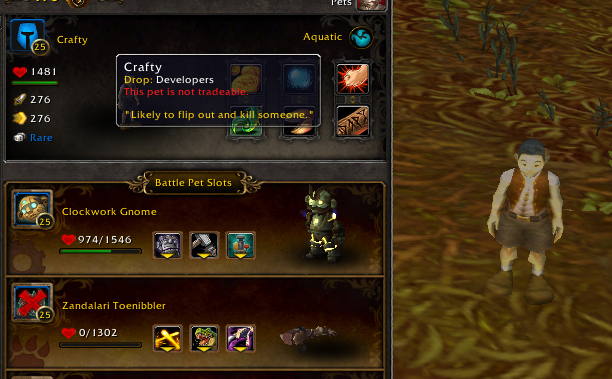 The dev connection, as alluded to in the preamble, is that Lil Bling is the self-proclaimed son and is shown in the current twitter header of WoW senior game designer Jonathan LeCraft (follow him on twitter at @TheCrafticus). 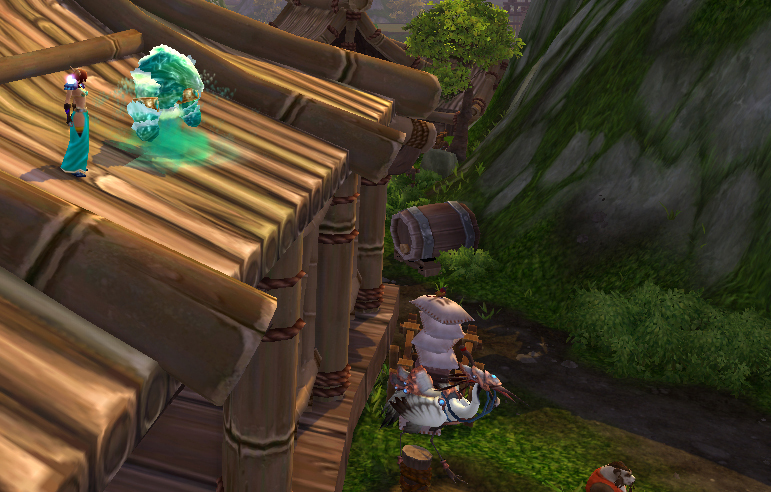 There are many items through the World of Warcraft bearing his name, like the elusive Old Crafty. This includes the pet Crafty, which was live on the 5.4 PTR for a short time, and then unceremoniously axed. One more pet down, some 600 to go. And now I need to take a shower. This entry was posted in pet profile and tagged auctionable, drop, mechanical, pet profile, sucking up, trade skill on January 13, 2014 by Liopleurodon. Let’s talk about this OP jerk. I’m sorry, was that overly prejudicial and just a tiny bit bitter? The reason, as a dedicated pet battle blogger, I kind of hate this pet is because its moveset gives it a bunch of utility unparalleled in nearly any other pet. 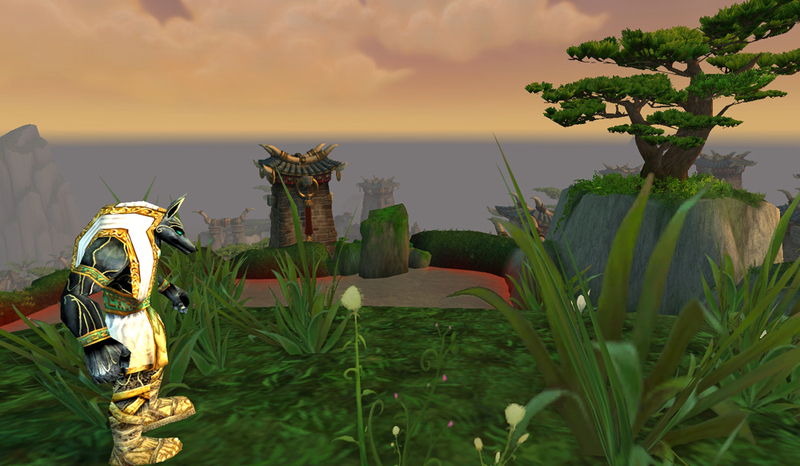 If I write a walkthrough somebody frequently chimes in with, ‘I just use the Idol.’ Well, unless it’s an encounter better served by using the Pandaren Water Spirit which–don’t even get me started. If you’ve read through the archives here and are familiar with the blog a bit, you’ll know that my style of guide is somewhat wordy. I usually describe a fight, my tactics, and make suggestions of types of moves across a number of pets to counter a tamer’s strategy. My aim is that you’ll be able to find a solution to a tamer’s puzzle with what you have in your stable already, even if you need to level it a bit. As such, you’ll frequently see phrases like, “a damage shield” or “avoidance move” or “a pet with some kind of weather.” The reason I engaged in that bit of baldfaced bias earlier is because this pet? This pet has all three of those. The Anubisath Idol has Stoneskin (damage shield), it has Sandstorm (weather, and ersatz damage shield to boot), and it has Deflection (avoid). There really isn’t another pet with this kind of utility. A snail may come close, but the function of the more difficult to time Dive makes it so that you’re still somewhat vulnerable to certain counters and definitely to most DoTs, while Deflection is a straightup dodge everything move. Also, the Humanoid Anubisath has very few weakness in the current tamer battles while Critters generally get eaten alive on the regular. 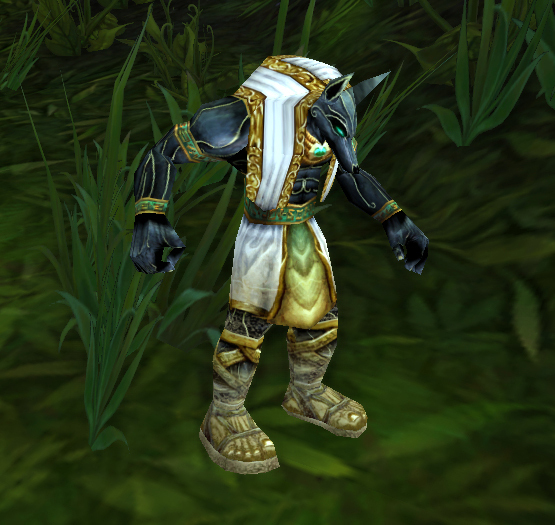 As a result, the Anubisath Idol can stand in on nearly any of the Pandaria tamer battles without blinking an eye. I’ve seen a few walkthroughs floating around claiming that you can carry a pet on all of the Pandaria tamers with him and one other battle pet. His one Achilles heel is that his offensive accuracy is a bit low. His highest accuracy offensive move, Crush, is a base 80% hit chance. If you happen to choose Sandstorm, its accuracy hit means this plummets further to 70%. His other main offensive move Demolish shares that slot, and hits ludicrously hard but has an extremely low base 50% chance to hit, making it generally a poor choice prone to RNG woes. To round out the moveset, also RNG-heavy, is Rupture, with a 25% chance to stun. This shares a slot with Deflection, generally making Rupture not worth it. His model is a fun, unique one, straight out of AQ40, which is where he drops. You can also buy him off your friendly neighborhood AH, but he tends to be on the pricier side because he is so invaluable as a fighter. He is also a part of the Raiding With Leashes achievement, making him one of many necessary to obtain in order to get Mr. Bigglesworth. Bigglesworth has a lot of good utility himself, with some avoids and a stun or two, but it’s not the near-universal utility the Anubisath has. Guys, I’d tell you to go nab this pet ASAP but really, this guy’s utility is so good that he’s kinda putting me out of a job here. So if you love me and want to keep reading, please make like Nancy Reagan and say no to this teeny juggernaut. This entry was posted in Uncategorized and tagged auctionable, drop, humanoid, pet profile on December 31, 2013 by Liopleurodon. I don’t talk a lot about personal stuff on the blog. It’s usually all pet battles all the time over here. But guys. I hate spiders. No, you guys. like. I HATE spiders. HATE. haaaate. 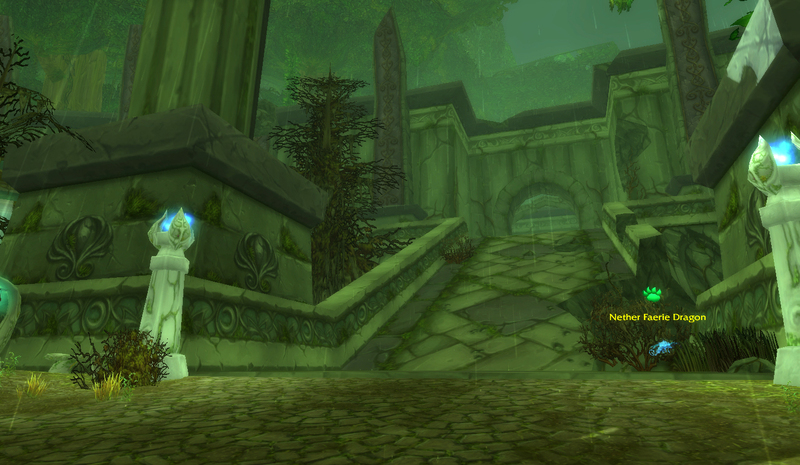 When I did Maexxna as a healer in Vanilla, I turned my character to the wall so I didn’t have to see her. When I did her in Wrath as a hunter, luckily the rotation had grown so easy I could spam my steady shot macro and close my eyes for most of the fight. 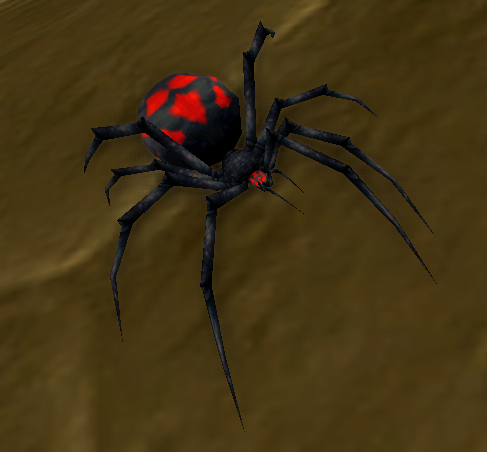 I am not even kidding, either about how much I hate spiders or how easy hunters were. I honestly don’t even know why. I’m cool with bugs and caterpillars. Snakes and lizards, sure. Even scorpions are fine. I’ve always had some kind of garden as far back as I can remember, because my parents were hippies and liked growing their own food, so I know spiders are good for nature and all that jazz. Something about that extra set of legs maybe? The way they move? The webs? I don’t know and I’d prefer not to think it over too hard just now thankyouverymuch. But there are a couple of reasons for me to explore their creepy little leggy crawly beady eyed oh god this sentence has to be over now. First of all, many of these guys are low-texture, and you know how that tickles my fancy. They were one of the first to be made over, into both a spindly-legged model and a fuzzier tarantula model, and now there are even more varied models to choose from. 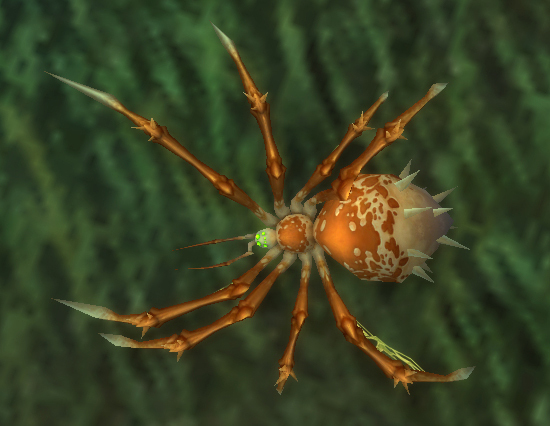 The low-texture version is also reused for Pandaria with the bizarrely pink Amethyst Spiderling and thus have spanned across expansion packs, so they kinda fill that same role as the frog. 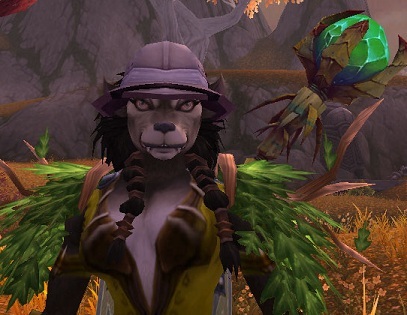 They’re also a fairly decent pet battler across the level gamut, which tends to be rare. They get the Leech Life ability at level 5 to heal themselves, and as a result they’re a hardy choice for grinding. Unlike the Frogs, spiders can have varied movesets. 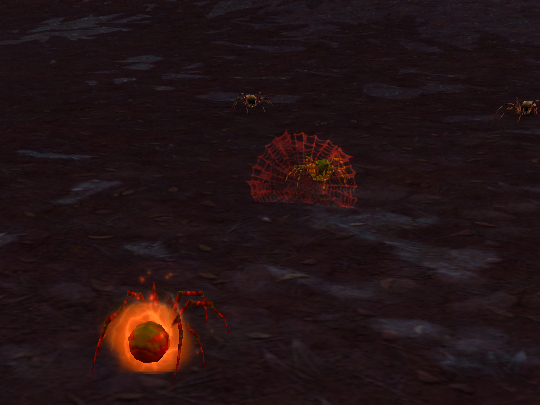 For example, the crystal spider has a stun instead of the DoT poison ability. My interest in spiders was piqued when I was dueling with Elepheagle one day. He completely wrecked my Black Claw DoT team with his spider. Rather than demand the answer, “WHYYYY” on my knees from an unanswering sky, I asked wowhead instead. Brittle Webbing typically inhabits the same slot as the regular old web, only gives quite a bit of reflexive damage on each attack. The damage can be countered by Sandstorm (WHAT CAN’T BE COUNTERED BY SANDSTORM argh) or the Shell Shield-type abilities. I haven’t quite fought enough to recommend it whole hog, but I’m trying out a new team, pairing the spider with a pet with Wild Magic and a third, heavy-hitting tank pet (but not a direhorn… the nerf for 5.4 is pretty bad). If you find yourself coming up against DoT teams I definitely recommend trying out a spider. …you know, as much as I *could* recommend trying out a spider. blerg. 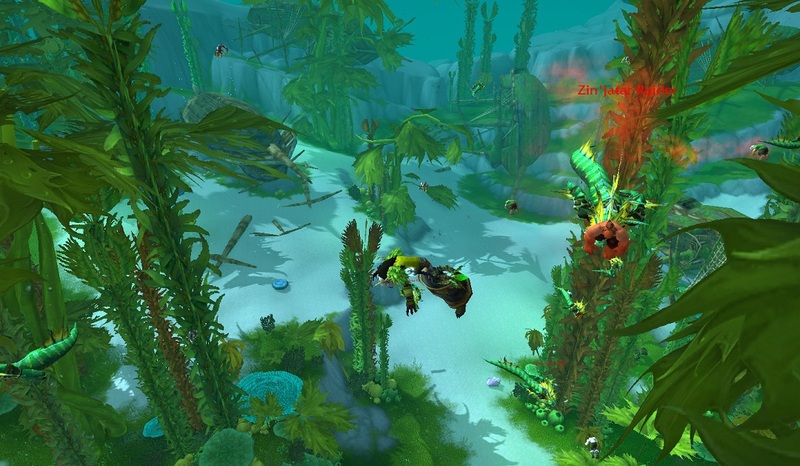 This entry was posted in pet profile and tagged critter, drop, quested, tamed on August 1, 2013 by Liopleurodon. I have a toddler, so I hear this question like eighty thousand times a day. But one day, I started thinking about it in terms of pet battles. Up until now, I’ve been pretty much assuming that you’re here because you’re a Tamer in some capacity, whether you’re just looking for your first basic tips, or looking for help with end-game PVE. 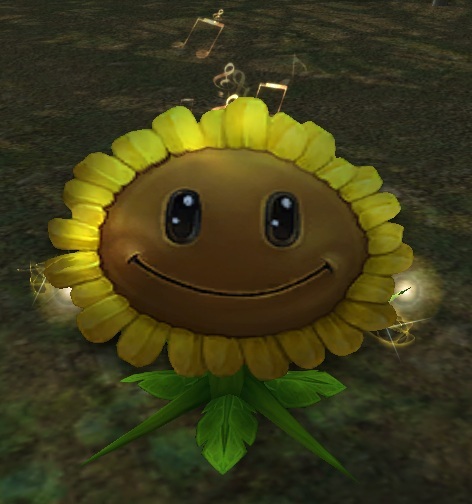 I know that there are many World of Warcraft players out there who could not give less of a damn about my beloved battles though, no matter how hard the Singing Sunflower tries to hypnotize them into it. Even if you’re not all that into the whole pets thing of it all, I’d like to hopefully supply Why You (yes you) non-Tamer, should try out the minigame. I’ll skip the two most common arguments I see: Pets Are Cute! They Give You Achievements! If you thought pets were cute enough to be worth collecting you’d already be doing it. If you’re an achievement hunter at all, you know they give you achievements. They have their own tab in the achievements window. So, duh. And yeah, that was me skipping them. Ahem. Moving on. The most notable reason to start pet battling is probably lesser charms. You have a chance to get Lesser Charms from virtually any pet fight as long as you’re level capped. I’ve gotten from 2-6 at the end of any particular battle. This means even if you’re just in queue for LFR or whatever, and you pull out the cat you just bought from Donni Anthania to kill rats in Stormwind, you could get several lesser charms in the meantime. I got 3 of them from the very first pet battle I did on the 5.3 PTR. Yeah, you could just do dailies to get these instead. But look, if I ever see Anji Autumnlight again it’ll be too soon. I still need to accumulate Lessers to trade for Mogu Runes so I can repeatedly get a second shot at a Ji-Kun Hatchling or whatever. I’m sure there are other uses for the Runes as well, like gear or something. Psh. The chance to get a charm increases based on the level of the pets you fight, but you get them regardless of whether you fight them with all like level pets or with level 25 ringers. When I was doing the Beasts of Fable battles, I averaged 20 per day just from doing that, which means there are 20 meaningless tasks you have to do for these bozos. Even if you’re not max level, now that pet battles grant XP, that’s a good reason to start battling. As I noted in this post, the XP starts off kind of crappy at low pet levels. I don’t know about you though, I’d rather level an entire team from scratch again than go through Hyjal or Vashj’ir again. Especially Hyjal. But ESPECIALLY Vashjir. I don’t know about you, but I just started twitching a little. 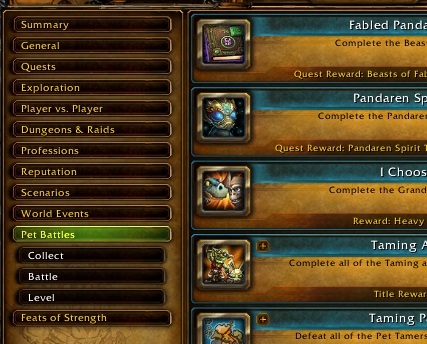 As noted above too, you can queue for LFD and pet battle instead of questing for an extra XP boost in between. The last reason I’m going to mention is financial. There is a lot of coin to be made buying and selling rarer pets in general. The thing is, if you level up those pets your margin suddenly drastically increases. It takes literally an hour to level a pet like that from 1-25 if you have a few trainers left up in Pandaria for the day, but even if not it doesn’t take terribly long. It’s also more effort so you’re less likely to get into undercut wars with other players. Most of that hour is travel time too, so combine that with a gathering profession and you’re really in business. You can also get upgrade stones, which will make you a ton of coin if you trade in pets like the Argent Tourney or Childrens’ Week uncommons. Even just the BOE stones (which are admittedly exceedingly rare) can go for upwards of 5K a pop. I really hope I convinced you to give pet battling a shot. Even if you weren’t convinced, at least I’m comforted by the fact that I don’t have to do Vashjir again. So, win win, right? This entry was posted in Uncategorized and tagged auctionable, drop, Raid on April 6, 2013 by Liopleurodon. The Isle of Giants is now live, which means there are 5 new pets out there just waiting for a good home. So, I got suited up for a new adventure. The shoulders are to help me blend in with my surroundings. This is some big game hunting we’re about to do, and we really need the camouflage. You’ll see. I mounted up, fired up some tunes, and headed for parts unknown. Well, slightly unknown. 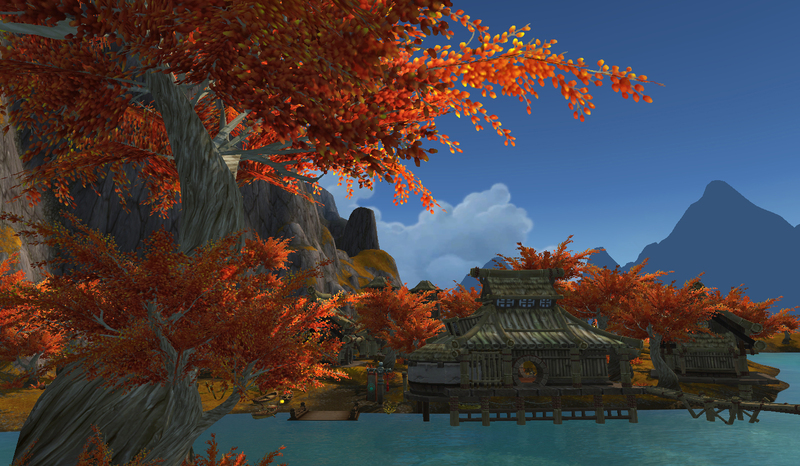 To get to the Isle of Giants the first time, go to Zouchin Village in Kun-Lai and start flying north. You’ll start to get fatigued, don’t panic. 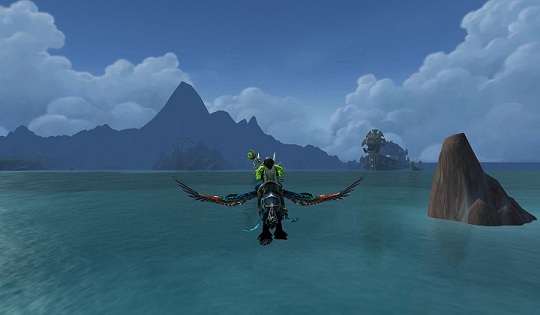 Because you aren’t allowed to use your flying mount on the Isle, once you cross over into its waters, you will be dismounted, but that’s cool, just turn into a whale if you can and keep swimming. Oh, YOU can’t turn into a whale? Well, keep swimming anyway. You’ll make it. Probably. 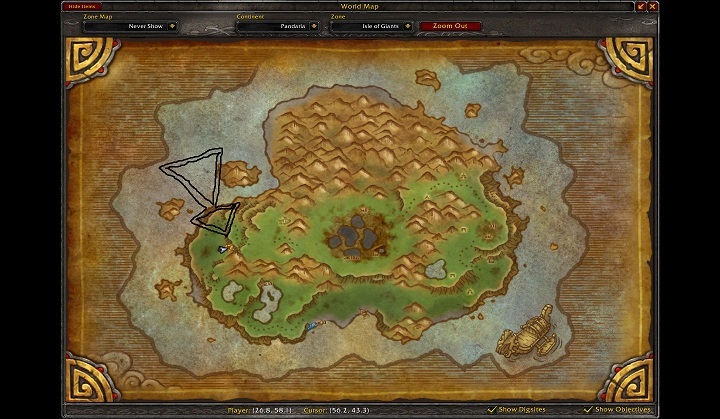 Once you get there, make sure to pick up your faction’s flight path on either side of the beach that greets you as you swim up: Alliance in the West, Horde in the East. Aw, they’re slant-wise named after one of my favorite dinosaur video games of all time, Bubble Bobble. I wonder why. Hmm. Oh man wait, there are dinosaurs here! In fact, therAAAAAIIIEEEEEEE! Besides exploring and getting smashed to bits by enormous dinosaurs, there are 2 things for pet collectors to do. You can kill dinomancers for the adorable pets they drop. There are 4 tiny baby raptors wearing helmets. They will soulbind to you as items, but you can cage them and sell on the AH if you get too many of one type while waiting for the one you don’t have yet to drop. 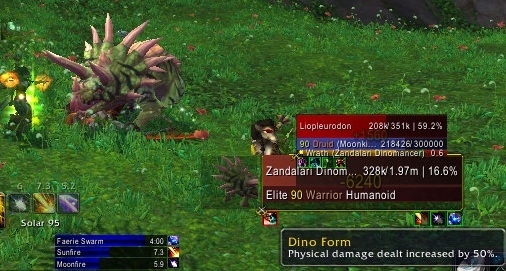 As of now they’re ranging ~300g, but that should drop shortly, as hunters also need to kill the dinomancers for the very rare book that allows them to tame the direhorns on the island. For me as a moonkin, the dinomancers can be tricky. They have an ability which heals them to full, but they only cast it when they’re above 50% health. It’s a relatively short cast, and if I screw up my interrupt with a minute-long cooldown (seriously, a minute? siiiigh) I basically have to wait that minute. However, once they go down below 50% health, they stop casting. Why? Let’s just say it’s kind of difficult to cast a heal when you’re a triceratops. 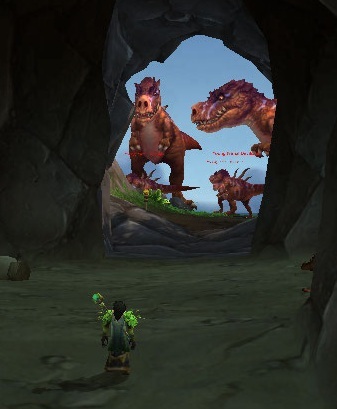 So, why even kill these guys, if it’s difficult and you can buy those silly raptors off the AH anyway? Well, look up 2 screenshots. See that bone? Yes, I said bone. Stop giggling. That bone is currency. You go here, in this cave on the map, to do so. You can trade in 1 bone for like 2g, 10 for a mote of harmony, or 999 for a spectral porcupette. Once you get all your baby raptors though, I’d consider switching over to killing direhorns, as they drop far more bones per kill and also have a chance to drop an egg. The eggs haven’t been fully datamined yet, but from the anecdotal commentary on wowhead, it seems like they’ll contain mounts and other goodies. Update – The very first thing I got out of my primal egg was a sweetass black raptor mount. This entry was posted in Uncategorized and tagged 5.2, adventure, dinosaurs, drop, farming on March 10, 2013 by Liopleurodon.